Drum Tools includes all the Nomad Factory trademark effects; Gate, Expander, Compressor, Convolution Reverb, High Pass, Low Pass Filters and amazingly well Tuned EQs and Kit Piece reference presets. 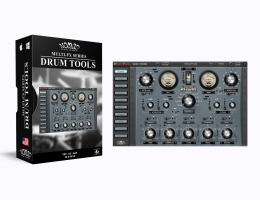 Drum Tools gives you the means to "Mix your Drums to perfection!" In addition, you can use the DLA2A NF type compressor as heard in the successful Bus Driver plug-in. This unique vintage compressor will breath life into your Drums, make them punchy and add a solid character that will define your tracks. And, you can now push all of these controls to the limit using the efficient output stage 'soft clipper' that will ensure you never go over "0dB", avoiding unwanted digital distortion. If you want to have a successful mix out today, your Drum sounds had better sound amazing, punchy, have clarity, and sit "in the mix!" Drum Tools was made exactly for that purpose, to give your Drums a powerful/modern sound. With its pre-tuned presets and complete set of sound-shaping tools, you will finally be able to mix your Drums and craft them to a pro standard in a simple, compact, one plug-in UI. You will have control over the elements that can give you the creative edge and take your Drums to a whole new level. Here is a great video done by Jerry Mateo of Inthedaw showing all the features of Drum Tools.